Sarah Nader- snader@shawmedia.com Lindsay Bright, 18, of Cary poses for a portrait outside Cary-Grove High School Thursday, March 10, 2016. Bright won a statewide award for her work with TOPSoccer, a program that gives any boy or girl with a physical or mental disability the oppotunity to play soccer. Lindsay Bright, 18, of Cary poses for a portrait outside Cary-Grove High School Thursday, March 10, 2016. 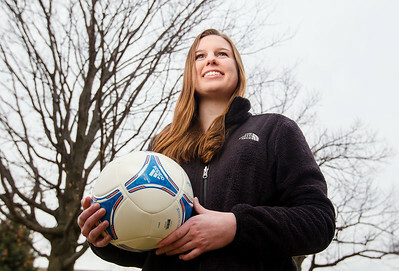 Bright won a statewide award for her work with TOPSoccer, a program that gives any boy or girl with a physical or mental disability the oppotunity to play soccer.